Anthemion (An-THEE-me-un) is a term for a collection of palmette motifs common to Egyptian, Assyrian, Phoenician, Cypriote and Greek Art, universal in its beauty. Whether this design element evolved from the shape of the lotus blossom, palm fronds, acanthus leaves, or even the palm of the human hand is a matter for speculation. The beautiful stitch motif that borders this silken wrap echoes the form that anthemia take in trimming vases, stone carvings, and columns throughout history. The repeating chevron pattern in the center of the wrap flows naturally from the peaks and valleys created by the anthemion motif. This wrap is worked from one short edge to the other in one piece. The border patterns are designed to be similar enough to match, but not exactly the same. 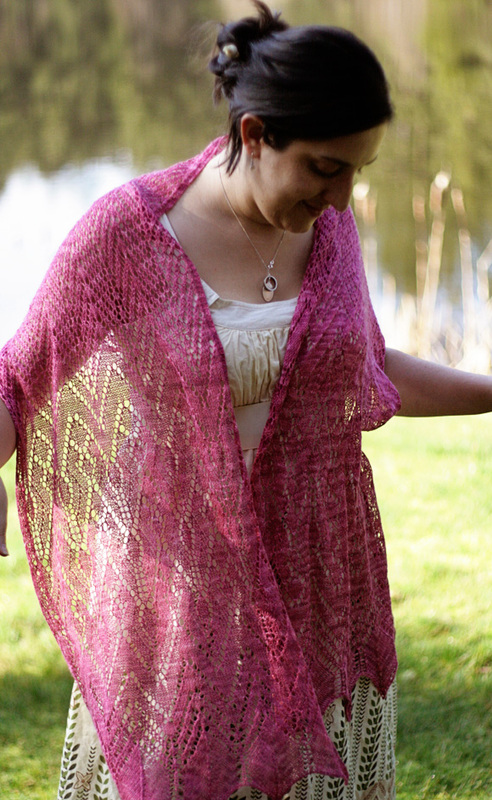 This wrap can be easily adjusted for length and width to accommodate a variety of yarn choices (see notes). M1 (Make 1 stitch): Insert left needle, from front to back, under strand of yarn which runs between last stitch on left needle and first stitch on right needle; knit this stitch through back loop. 1 stitch increased. Stitch Markers: Blue lines in charts indicate stitch marker placement, dividing garter st edging from main body of shawl. If desired, stitch markers may also be placed between repeats of lace pattern to help keep track of pattern. If using markers in this way, place them at edges of outlined pattern repeat, corresponding to vertical red lines within chart. Important note: There are places within the charts where a double decrease (sk2p or S2KP) is worked directly after a red line. When this happens, work as follows: Sl st before marker to right needle, remove marker, return st to left needle, place marker on right needle, then work decrease. If you wish to make the wrap longer or shorter, work more or fewer repeats of Chart E.
If you wish to make the wrap wider or narrower, add or subtract a multiple 22 sts to the number of sts you cast on; this will add or subtract one pattern repeat. 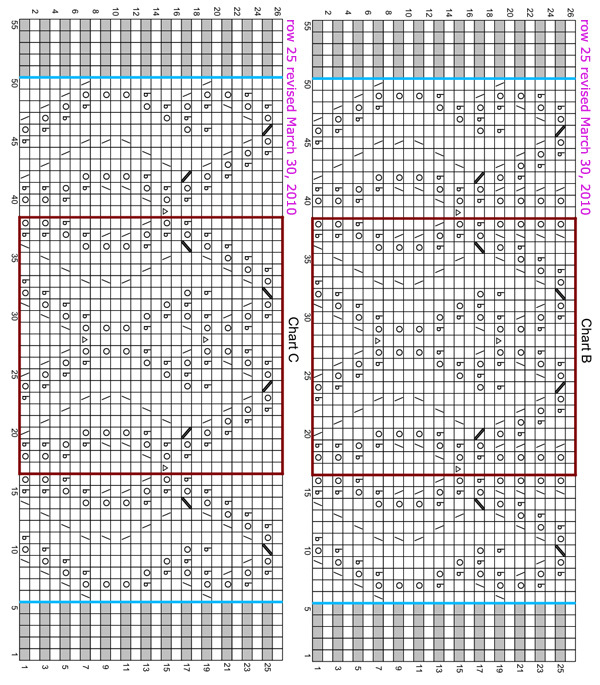 For example, to widen the wrap by one pattern repeat, CO 143 sts; to reduce the width by one pattern repeat, CO 99 sts. Using Long-Tail Cast On and two needles held together, CO 121 sts. (Casting on using two needles held together will ensure a stretchy CO edge.) Remove extra needle before working first row. 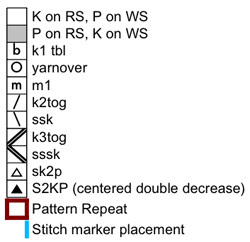 Work Rows 1-2 of Chart A six times, placing stitch markers as indicated (see Pattern Notes). Work Rows 3-50 of Chart A once. 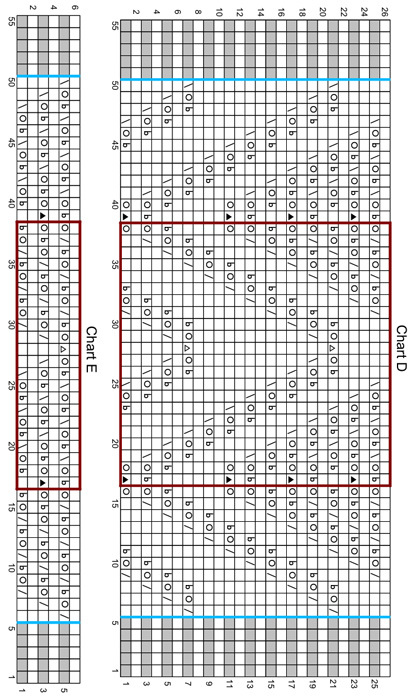 Work Rows 1-26 of Chart B twice. 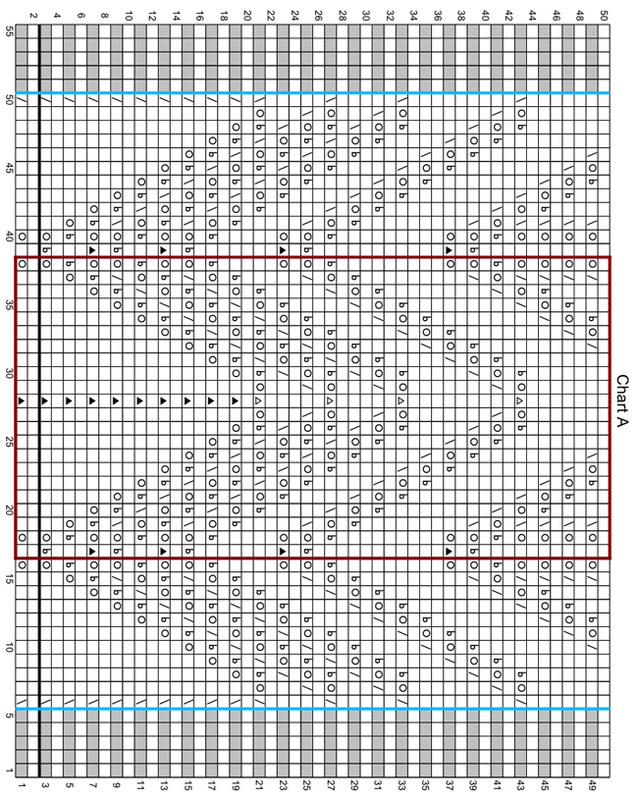 Work Rows 1-26 of Chart C once. 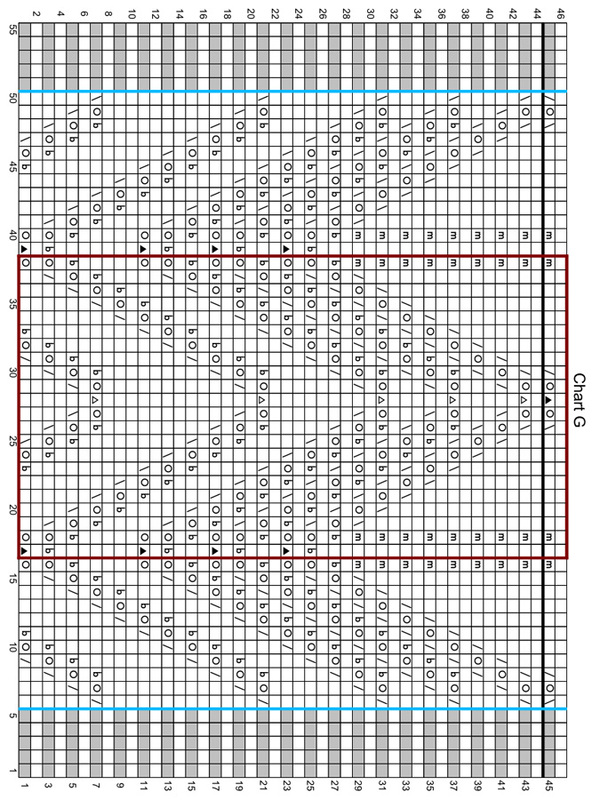 Work Rows 1-26 of Chart D once. Work Rows 1-6 of Chart E 30 times. Work Rows 1-34 of Chart F once. 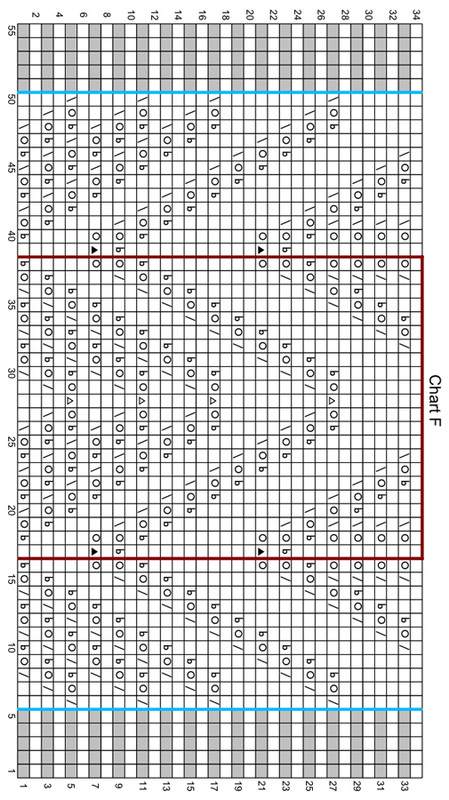 Work Rows 1-46 of Chart G once. Work Rows 45-46 of Chart G 5 times more. P 1 row (a RS row). BO all sts with WS facing as follows: P2, [insert left needle, from left to right, into backs of 2 sts on right needle; p2tog from this position, p1] until last 2 sts remain on right needle; p2tog. Weave in ends. 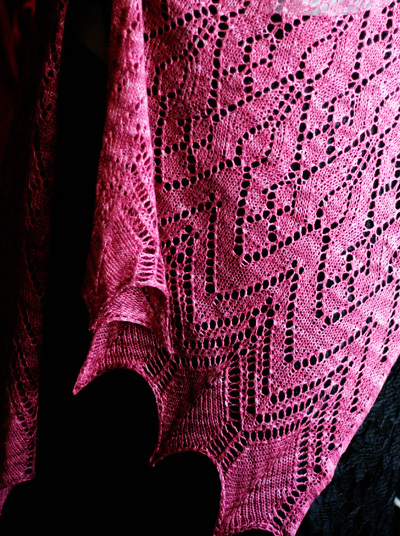 Wet block by soaking in lukewarm water (with wool wash if desired) for 15-20 min, until shawl is thoroughly saturated. Pin to desired measurements, pinning scallops on CO and BO edges to form points; see links in Pattern Notes for more information on blocking lace. Allow shawl to dry completely before removing pins. 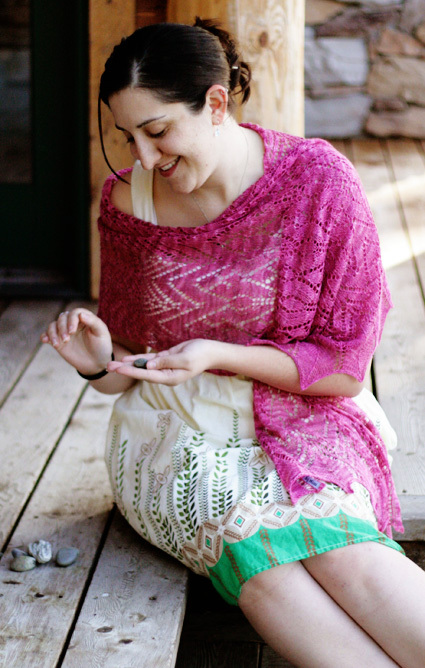 Miriam Felton started playing with fiber, yarn and thread as soon as she could hold a needle. 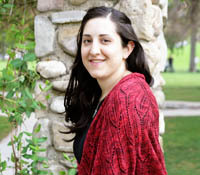 Miriam has had designs published in Interweave Press magazines and books, the on-line magazines Knitty, and Twist Collective, the book Sensual Knits, as well as self-publishing patterns via her website. Miriam is currently writing her first book. She blogs here. When not knitting, Miriam can be found frequenting various Salt Lake City coffee shops and bookstores while wearing her tiara.